In 2006 the team here at Surf & Adventure Co. started a new expedition. We decided to produce our very own surfboards. Many staple shaper's of our industry started for one purpose, and that was to build boards made to endure and take on the surf around that location. That is just what we have done here at Surf & Adventure, thanks to Matthew Tatum, who joined us as our most recent shaper within the last year. Our experience of Virginia Beach and general East Coast surfing has lead us to be able to focus on shapes made for the East Coast, and really push and innovate East Coast surfing to another level. 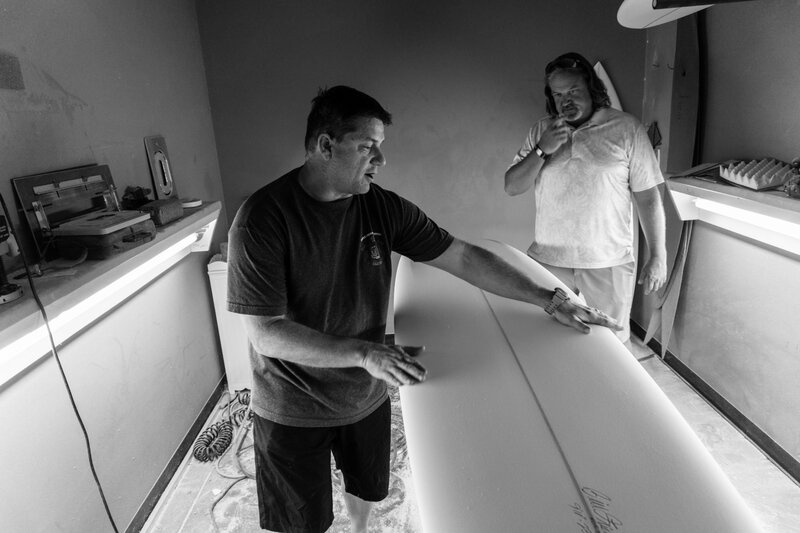 Matthew Tatum talks surfboards with one intrigued customer. Matthew Tatum has been happily shaping since the year 2000. He started in Florida to build his personal quiver and eventually developed a professional career when he moved to Hawaii in 2010. His biggest influences include master shapers Mark Liddell, Jason Cashawah, and Gordon Hansen. "What makes me different is I have never ripped a surf design, which has really allowed me to better my shaping ability, and to create original shapes based off what I thought worked best." One of our very own boards ready to be brought to our shop down in Sandbridge, Virginia Beach. When Matt designs a board he has the true idea that it is going to be surfed here in Virginia or somewhere near by on the East Coast. He still uses his Hawaiian background as a foundation in his shaping, maintaining true principles that work well with solid waves. Blending those two polar opposites really allows him to tackle the whole spectrum of surfing, from a summer day in Virginia Beach to a hurricane swell in the Outer Banks. Matt first started hand shaping boards, which really allowed him to build his stock templates and overall skillset in shaping. Once the workload became heavier and time was much more valuable, he transitioned to machine shaping. Currently Matt is the only shaper on the East Coast with an Aku shaper CNC cutter. This has really allowed him to push innovation in surfing by being able to constantly r&d designs through the programming, where he has a strong skillset in that he developed through his military career. Matt has a great story and this is just skimming the waters. To check out more about our shaper please check out our Q&A blog post here. Surf & Adventure Co. loves getting our family and friends dialed in with custom dimensions of our shapes, and even have creative flow throughout the process, so never be afraid to express your creativity through your next custom here at Surf & Adventure Co. Call us at 757-721-6210, email us at surfandadventure@gmail.com, or even just come chat at our shop in Sandbridge for your next custom!